Dara Fitzpatrick was the Irish Coast Guard’s most senior helicopter search and rescue pilot. She lost her life in March 2017 whilst Captain of the Irish Coast Guard Dublin-based Rescue 116 helicopter. Dara was the first Irish Marine Emergency Services woman pilot. In 2010 she and her crew received the “Best of Irish Award” for rescuing an airplane pilot who had crashed into the Irish Sea. In August 2013, Dara and her colleague, Captain Carmel Kirby, made Irish aviation history when they crewed the first all-female mission in the Irish Coast Guard helicopter service. Dara was well-known for her starring role in Rescue 117, a 2011 documentary series on RTÉ which gave behind-the-scenes access to the Irish SAR service. Tragically, Dara died after her SAR helicopter, Rescue 116, crashed into the Atlantic Ocean during a rescue mission off the west coast of County Mayo, Ireland. HeliOperations worked closely with Dara during the Irish Coast Guard’s transition from the S61 to the state-of-the-art S92 helicopter in 2013. HeliOperations crews not only provided S61 crews during transition but then also enjoyed 3 years providing S92 Captains to augment the Irish Team. 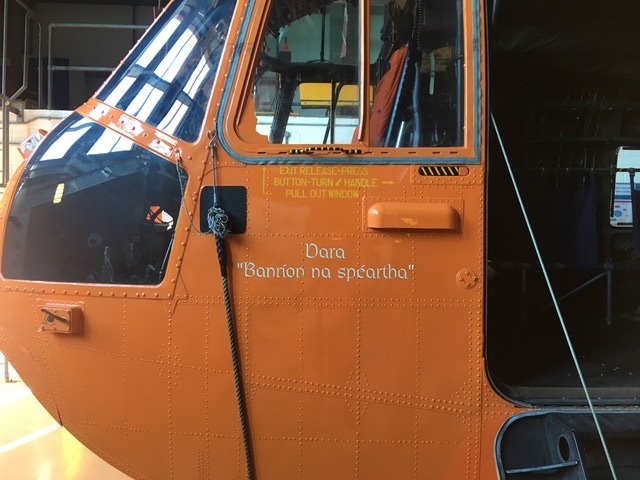 In recognition of our close relationship, as a mark of respect from Dara’s SAR colleagues, and as a fitting tribute to Dara’s gallantry, HeliOperations have named Sea King XV166, “Dara”, and have added, in Irish Gaelic, the caption “Banríon na spéartha”… Queen of the Skies. HeliOperations are working with Dara’s family and friends to provide support to young Irish women wanting to enter aviation … inspired by Dara and following a route trailblazed by Dara.